When you first get in contact with the TM you soon notice that it consists of several different types. A novice in the dogworld would have trouble seeing that they all belong to the same breed and it can be a bit confusing before you understand that things are as they have always been. Diversity is something that follows the TM through the centuries. This is a breed hailing from the vast region of Tibet. The people of this country have used their dogs for many tasks and demanded dogs capable of performing the work at hand. It is not strange that different types would evolve to better suit the life and hardship in different areas. We have the smaller and lighter TM that watched over herds on the slopes and plains. We have the heavier and larger TM said to guard monasteries and monks. We have different types from different areas of Tibet - smoothcoated ones and longhaired ones. They have all adjusted to the life around them and have been shaped into the dogs we see today. It was the ones with power in their bark, the brave ones, the clever ones that carried on the legacy. There was a need for agile and strong dogs who could guard the livestock and protect them from foes and there was a need for impressive gatekeepers at the monasteries, holding intruders at bay with their deep voices and fierce look. The dogs had more roles to play than these two, they were used in many ways and adjusted to the conditions of life. 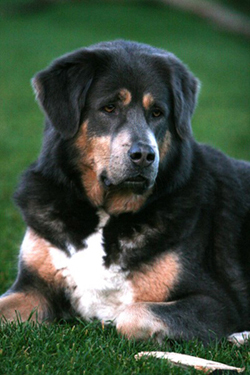 When these dogs came to the west they were all called by their new name: Tibetan Mastiff. People thought of them as one breed and being used to the breeds in the west they had a very clear image of what a breed is - dogs who are all similar in type, temperament and looks. The TM does not quite fit that description. They all have similarities but are they really just one breed? The question is a hot topic in the TM world today. The lighter boned and smaller type with dry lips. The heavier boned and taller type with more lips. To me this is a very interesting topic and I am amazed at the feelings that this subject brings out in breeders and owners. It is very sad to hear negative things about the different types since they are all gathered under one name. I think it's strange that all these different dogs have been pushed into one form but at the same time I am in love with the diversity of our beautiful breed. They are all very special, no matter if they are big, small, heavy, light, longhaired, smooth, golden, black or blue! 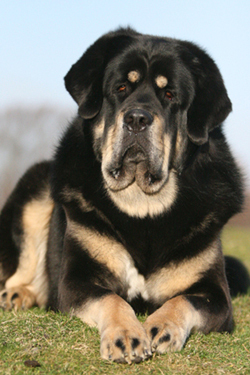 Long live the Tibetan Mastiff, the chameleon of the dog world!